Freshman Zane Miller attempts to beat a Northwest defender in the Falcons victory Tuesday night, 3-1. The Lady Falcons defeated the Mohawks Tuesday night by a final score of 2-0. 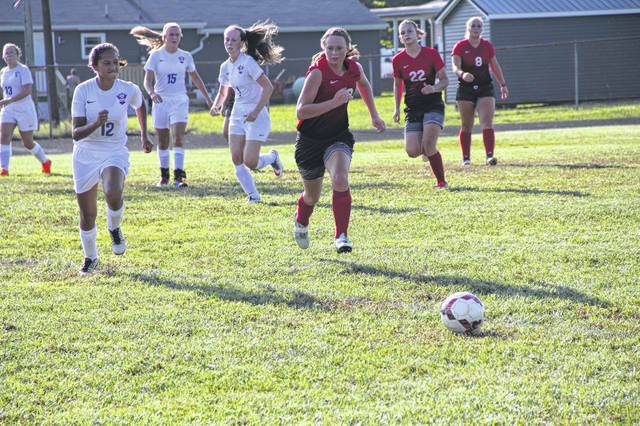 The Minford Falcons boys’ and girls’ soccer teams took both games of a double header against the Northwest Mohawks on Tuesday night. The Falcons started off strong as junior Adam Cordle scored with the assist coming from junior Luke Montavon. Northwest fought to gain the momentum back as they pressured the Falcons’ defense on every run. Going into halftime, the Falcons led with a score of 1-0. Northwest came out of halftime looking to even things up as sophomore Brayden Campbell scored his team’s first goal of the night and tied the game two minutes into the second half. 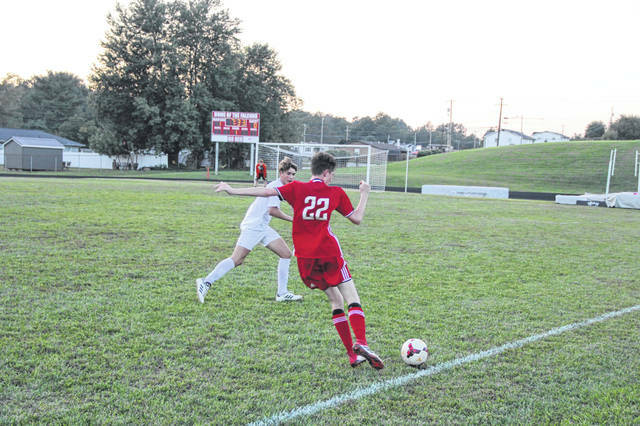 With nine minutes to go in the game, sophomore Caden Banks scored an unassisted goal on a huge run up the left side of the field which gave the Falcons enough breathing room to win the game by a final score of 3-1.
https://www.portsmouth-dailytimes.com/wp-content/uploads/sites/28/2018/08/web1_IMG_1365.jpgFreshman Zane Miller attempts to beat a Northwest defender in the Falcons victory Tuesday night, 3-1.
https://www.portsmouth-dailytimes.com/wp-content/uploads/sites/28/2018/08/web1_IMG_1238.jpgThe Lady Falcons defeated the Mohawks Tuesday night by a final score of 2-0.